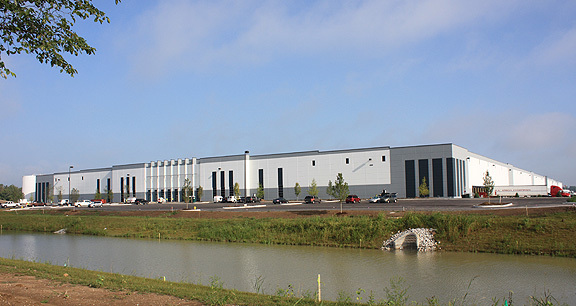 Project obstacles and solutions: Browning Investments and Duke Realty formed a joint venture to build a new Walmart e-commerce warehouse and distribution center at the AllPoints Midwest Industrial Park in Plainfield, Indiana. The 1.2 million square foot facility features 100 semi docking doors. This building was fast tracked through the construction process so that it would be turnkey completed in six months. Rescom Construction poured and finished all of the interior floors inside the facility. Custom Concrete finished the exterior concrete surrounding the building at the loading docks, the sidewalks, extruded curbs and trailer parking areas. With very tight deadlines, these two finishers needed a continuous feed of concrete, but also had very different engineering specifications. The interior concrete was a special mix designed for large warehouse floors. The floors were specified as 9 inch slabs on grade with a compressive strength of 5,000 psi. Typically more cement is added to a concrete batch to increase the strength. In this case, IMI worked with Browning and Walmart to design a floor mix that used a blend of large and small coarse aggregates to achieve this strength requirement without adding more cement. IMI supplied 35,000 yards of concrete at a rate of up to 150 yards per hour for the floor. To prevent curling, Rescom used an early entry saw to cut control joints. Typically control joints are added after the concrete has hardened and is at least 24 hours after the pour. Early entry control joints are cut 5-8 hours after the pour. At the same time the interior slabs were being poured, Custom Concrete was pouring 8,000 yards of exterior concrete around the structure. IMI supplied up to 500 yards per day for the exterior work and up to 1,000 yards per day for the interior floors.